Spa Dolce Bellisimo in Metairie, LA, is located within the cosmetic plastic surgery practice of Dr. Stephen Metzinger. 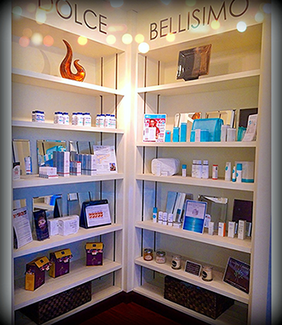 Our beautiful, luxurious spa offers a full line of the latest products and services for nonsurgical skin rejuvenation. All procedures are overseen by Dr. Metzinger, a board-certified plastic surgeon, so you can rest assured that your safety is in the best hands possible. Whether you choose spa treatment alone or to complement a cosmetic plastic surgery, you can expect a relaxing experience, with warm towels and amenities such as iced lemon water with your treatments. To learn more about how you can get smoother, clearer skin with our noninvasive skin treatments, contact us today. Our therapists are highly trained and stay current with the latest advances in skin rejuvenation. We can help you look your best and reduce signs of aging with custom treatments to improve your skin’s texture and clarity. Some of our most popular top-of-the-line treatments include laser skin resurfacing, Ultherapy®, and chemical peels. With a careful evaluation, we can recommend the appropriate treatment to give your skin a fresher appearance. This treatment uses concentrated light energy to remove the outer layers of skin so that newer, undamaged cells are revealed. Laser therapy also stimulates collagen production and the development of new skin cells. Laser treatment works best for smoothing fine lines and wrinkles on the face, reducing the appearance of acne scars, and fading brown spots from sun damage. Patients with very dark skin tones or very minor skin imperfections may not be good candidates for this treatment. If so, we can recommend a different procedure that will produce beautiful results. Micro needling is the process of creating tiny holes on the surface of your skin to help stimulate and promote natural healing and the production of collagen and elastin. By using a small, pen-like tool that creates the tiny holes on your face, neck, décolleté, and arms, you will experience thicker dermis, along with softened wrinkles or scars. Additionally, the new micro-channels are ideal for absorbing creams and topical gels more effectively. The treatment, which many patients describe as feeling like sandpaper or a cat’s tongue will not cause any damage to your skin, but may cause some minor and brief redness. Peels can produce outstanding results on the face, neck, or hands. Chemical peels are similar to laser treatment since the outer layer of skin is removed to improve its appearance. It is a great option for smoothing wrinkles and improving the appearance of minor scars. Age spots, dark patches, and freckles can also be effectively treated with a chemical peel. As with laser skin resurfacing, this treatment is best for lighter skin tones, although some patients with darker skin tones may still be good candidates. In addition to peels, laser treatment, and Ultherapy®, popular treatments include various facials, fillers and injectable treatments, waxing, and microdermabrasion. We also offer eyebrow and lash tinting, Jane Iredale™ mineral makeup, and vitamins and supplements to keep your skin healthy and glowing from the inside out. Non-invasive skin treatments are an excellent option as an alternative or adjunct to cosmetic facial surgery. To reduce risks and obtain the best results, these professional-grade skin treatments should be performed in a medical setting and supervised by a skilled doctor. We provide only the most effective treatments under the guidance of Dr. Metzinger, an esteemed plastic surgeon. To learn more, or to schedule a consultation, please contact us today.